It lets you modify some console variables easily via interface options up to the real maximum. Show always a comparison tooltip for Items (without pressing SHIFT-Key). Change Wide-screen display aspect ratio. Land mount: Dismount when trying to use an ability. Stand up when trying to use an ability. Unshift/Unstealth/Leave shadowform when using an ability only usable 'unshifted'. "360 degree" will allow you to do loopings with your flying mount. Toggles the saving of UI settings, config, bindings and macros to the server. Default maximum is 15, possible values up to 50. Camera moves from saved positions smoothly (default) or instantly. Controls the view distance of the environment. Caches in memory textures when they are not in use for quick loading. 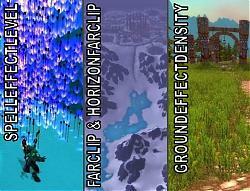 Density of high quality ground effects (grass, bushes..). Enable or disable fading of small objects. Controls model draw distance for doodads. Set the ambient value for characters (lighting). Determines which cores of your processor wow will load & run on. Set sound center to playercharacter or camera. 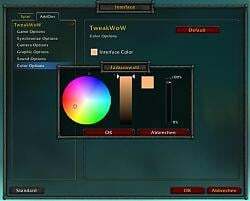 Changes the color of the unitframes, mainbar and minimap. Adds the 'rare' or 'elite' dragon around your player frame. Minor changes in some tooltip descriptions. New: some more options, e.g. increase Texturecache Size from 32MB up to 512 MB, select a higher Level of "M2Faster"-optimization for an improved performance in crowded scenes and disable ambient light if you want. New: some more options, e.g. 'PitchLimit' ...let's do loopings and fly on your head. New: some more options, e.g. screenshot format and quality, max FPS etc. This addon is dead as a door nail. 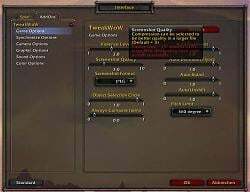 Is there any update for 5.0.4 patch, because i dont see the addon anymore in interface, the settings i had set it still works. sadly, addon doesn't work for me. it was ok till cataclysm. then i updated it. but nothing happens when i try any option. 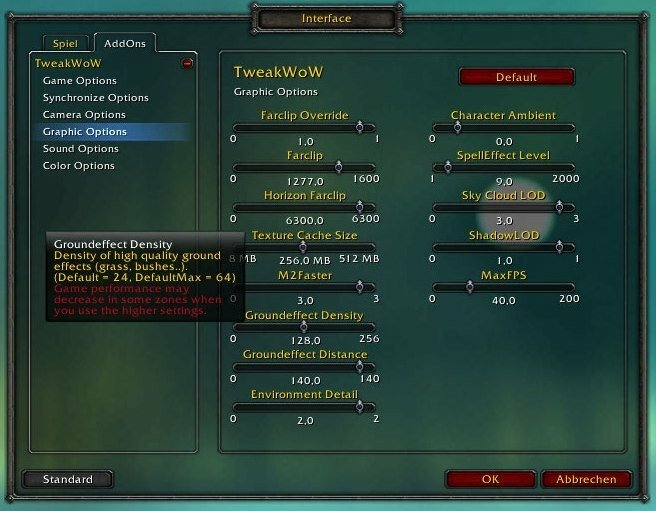 Will this be updated for 4.0.3a/b or has further development/work on tweakwow been abandoned? D3D11 is already added to the addon. One thing I have noticed, they seem to have changed the values for Environment Detail. If you go into the Graphics Options, even if you don't make any changes or hit cancel, it lowers your Environment Detail below the default Fair setting and you have to change it again on the built in video options. Ok with the old version of Tweakwow I had the spell effects up waaay high. 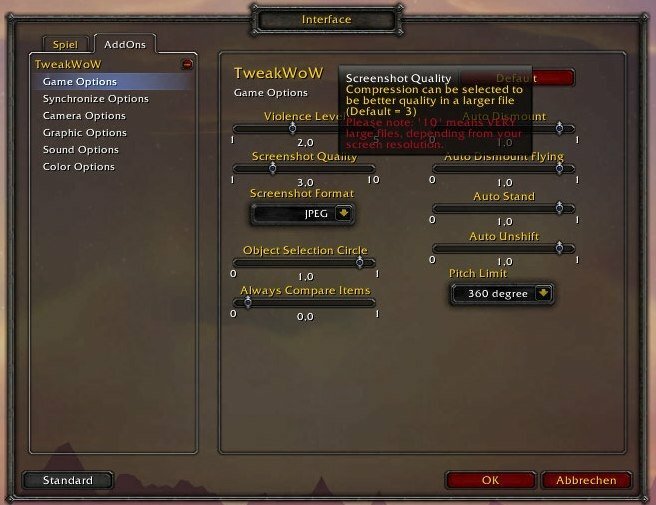 (I have a boffo system) Now the updated Tweakwow doesn't have a slider for Spell Effects anymore and I can't put it back to normal. Even using the slider in the built in blizzard Video settings to lowest won't turn them down. So now, when I cast blizzard or some other AOE spell everything in that spell is totally obscured with spell effects. Can someone tell me what settings to change in a text file to drop it back down? I havent played for almost a year and I love TweakWoW back then. Is it me or is the view distance since the patch drastically reduced? The game look far more "ugly" too me with max settings. Last edited by Kalmarin : 10-23-10 at 12:45 PM. Hey! In the 4.0.1 patch notes there is a brief mention of new API for DirectX11 D3D11 that you could perhaps also include in the addon ?